There’s another post on this here bloggy thing about the documentary concerning the aborted 1990s Tim Burton Superman movie. As I was writing that piece, I started to include a brief outline of what I think a good film starring said superhero might be. Only the “brief outline” quickly ballooned into well over 1,500 words. So, rather than lose the focus of that review I decided to post the full outline here as a separate piece, and whittle the description down to a paragraph over there. So, for those of you with the patience and/or interest, here’s my brief treatment for a movie with the working title, SUPERMAN: BRAINIAC. COLD OPEN: METROPOLIS: A spectacular action sequence unrelated to the main narrative (ala James Bond): In the streets of Metropolis, SUPERMAN is battling a giant robot dinosaur that contains in its belly, a cell full of children. The ridiculous construct is a creation of THE TOYMAN, who controls it from a remote hideout. Naturally, Superman deactivates the robot (which he suggests would look great in his friend BATMAN’s cave headquarters), saves the children, and captures the Toyman. OUTER SPACE: As the main titles roll (yes, there are main titles, it’s a Superman movie, dammit), we travel into outer space where we see a demonic looking spaceship moving towards an inhabited planet in another galaxy. The ship hovers over the planet, and a large, red beam shoots down, blanketing a city. In a matter of moments, the city is lifted into the sky, simultaneously shrinking down in size until it is a veritable dollhouse. Transported into the spaceship, it is placed in a large bottle-shaped housing with dozens of life-supporting tubes and gyroscopic leveling devices attached, and placed in a repository amongst hundreds of other similar shrunken cities. A skeletal, biomechanical hand caresses the outside of the bottle, and the camera pulls back to reveal BRAINIAC: the living computer whose mission is to collect and study species (sometimes via vivisection) from around the universe. METROPOLIS: THE DAILY PLANET: The whole gang (CLARK KENT, LOIS LANE, JIMMY OLSEN, PERRY WHITE, et al) are in the midst of a busy day in the newsroom when word comes over the police scanner of a possible terrorist threat downtown: police are in pursuit of a van reported to be carrying explosives and headed for the financial district. Perry dispatches reporters to cover the story, and everyone races for the elevator. Except for Clark, who races for the storage closet (because this looks like a job for... you know who!). METROPOLIS: FINANCIAL DISTRICT. Superman flies downtown and from above witnesses a madhouse of police action, with police in pursuit of the van, exchanging gunfire with the terrorists inside. After a spectacular chase, Superman captures the terrorists, whose attempt to set off the bomb is foiled when Superman wraps it in his cape, muffling the huge explosion into a tiny billow. 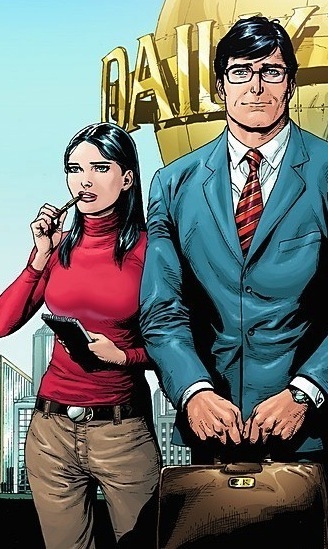 In the aftermath of the event, Superman is talking with Lois Lane, when suddenly the city is blanketed in a red ray of light. 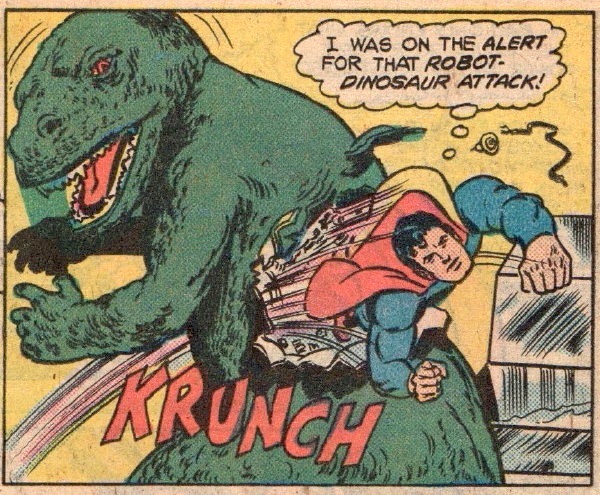 As Superman flies to investigate the source of the ray, he begins to weaken, and passes out, crashing to the sidewalk. While Superman lies unconscious, the city of Metropolis is captured by Brainiac and brought to his ship, encased in its own bottle prison. BRAINIAC’S SHIP, OUTER SPACE: When Superman awakens, he discovers that the red light (now serving as an artificial sun for the bottled city), emitting the same radiation as the star that his home planet, Krypton once orbited, has taken away his powers. Returning to his guise as a mild mannered reporter for a great Metropolitan newspaper, Clark Kent goes to the Daily Planet offices, where everyone is trying to make sense of what’s just happened. Suddenly, all televisions and computer screens are taken over by a message from Brainiac, explaining his mission, and that the tubes and cables attached to the bottle can enable the city to continue to function normally for an eternity, and that if the denizens of Metropolis will remain docile and accept their new situation, there’s no reason they can’t continue as a civilization (albeit one under a constant microscope). Brainiac then explains that he knows Superman is somewhere among the millions of people in the bottle (which is why the artificial sun is a power-sapping red instead of Earth’s yellow), and that he chose Metropolis in part because he finds Kryptonians fascinating, saying that he collected one of their cities—KANDOR—shortly before the planet met its demise. Clark is stunned to discover that he is not the last survivor of Krypton. Predictably, chaos begins to erupt in the Metropolis, and Superman enlists the help of WGBS-TV to broadcast a plea for citizens to stay calm and not riot, that, powerless or not, he’ll figure out a way to save them. 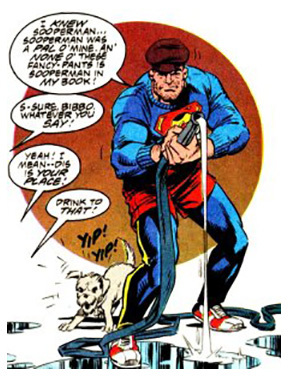 A contingency of citizens (led by waterfront bar owner BO “BIBBO” BIBBOWSKI) don Superman \S/ shirts and patrol the city, battling small time crooks and looters as Superman, LOIS LANE, and JIMMY OLSEN work with a small group of technicians and scientists from S.T.A.R. LABS to figure out a way to communicate with Kandor and escape from the bottle. Superman manages to open communications with VAN-ZEE, a Kandorian scientist in his early 60s who for years has been trying to attempt the same goals. We see what life has been like for the Kandorians, who’ve been trapped in the bottle for over thirty years. Working together, Kal and Van manage to (somehow, we’ll figure this part out later) simultaneously escape from their bottles (with Van-Zee’s dog, KRYPTO jumping in and coming along for the ride at the last second). Away from the red sun radiation, the Kryptonians’ powers return, and Superman uses Brainiac’s devices to return himself, Van-Zee and Krypto to full size. Superman instantly feels rejuvenated at the return of his full strength while the older Van-Zee struggles with his newfound super powers. 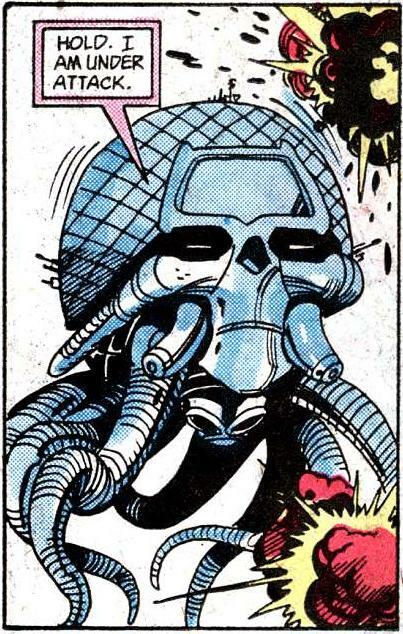 In the midst of a vivisection of an alien from another world, Brainiac is alerted to the escape. 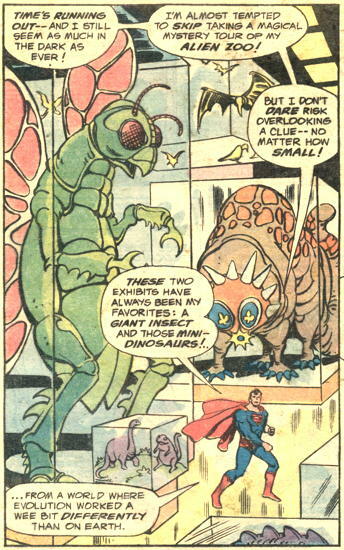 He unleashes a menagerie of creatures from a dozen bottles and sics them on the Kryptonians. After a knock-down brawl (in which a still-struggling Van-Zee is knocked unconscious), Superman and Krypto herd the creatures into a cell in the bowels of Brainiac’s ship. Krypto stays with the animals to make sure they don’t escape while Superman returns to the bridge to confront Brainiac, and a fierce battle erupts. A few times during the fight, various bottle cities are endangered (with POV switching between the fight and the terrified people in the bottles), and Brainiac notes that Superman puts the lives of others over his own. He removes Metropolis from its housing and warns that while the bottle itself is indestructible, all he has to do is pull the life-support to destroy everyone inside. Cuts to the citizens of Metropolis show their horror as they witness the gargantuan threat to their lives. But calm remains as they trust their fate to the hero. Superman stands down, but marvels that Brainiac, despite all of his scientific probing, has failed to understand what it is that makes humans so special in the universe. He remains calm as he describes their unrelenting hope and faith, despite so much evidence that their time on Earth is coming to an end. Superman continues. “Well, let’s put you to the test. Here’s a riddle: What’s faster than an angry Kryptonian?” Brainiac attempts to answer, “Without allowing for fluctuations in ability due to elevated levels of emotion, there are 27 organic beings in the known universe that can achieve velocity surpassing…” and Superman cuts him off. “Nope. The answer is TWO angry Kryptonians.” And slow-motion shows Superman and the recovered and fully-powered Van-Zee attacking the villain from two directions at super-speed, Van grabbing the bottle while Superman lands a punch so hard that it shatters the robot into pieces. 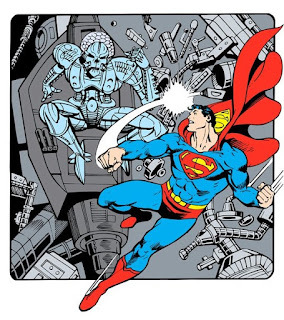 As his biomechanical parts attempt to reassemble, Superman traps Brainiac’s head inside of one of the empty domes, rendering Brainiac’s detached limbs inert. With Brainiac defeated, Superman and Van-Zee discuss what to do with the stolen cities. 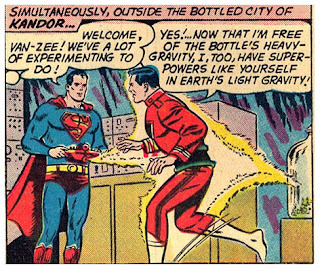 Van-Zee volunteers to use the ship to return them to their planets, but what about Kandor? 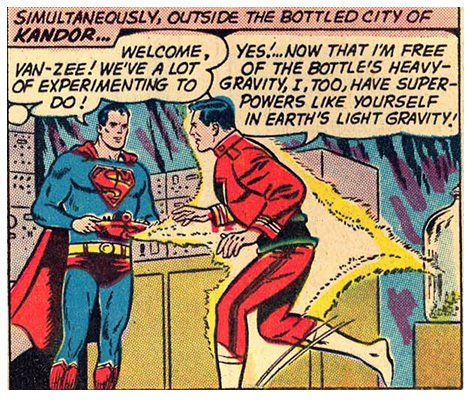 Superman suggests coming with him to Earth, but Van-Zee refuses, saying that not only is Earth not ready for thousands of Supermen, but that he doesn’t trust everyone in Kandor to be as selfless with unlimited power as Kal-El. Van-Zee will find a new planet for the Kryptonians somewhere in the universe. Superman grudgingly agrees. METROPOLIS: Everything is getting back to normal, as evidenced by a short sequence of Superman stopping a mugger, saving a pedestrian from a car running a red light, and putting out a fire at a sidewalk hot dog stand. He returns to The Daily Planet and talks with Lois about the adventure the entire city just shared, saying that he knew the people could handle anything. Lois says that she can’t imagine what it must be like to discover you’re not the last of your kind in the universe, only to lose them again. Later, Superman flies to THE FORTRESS OF SOLITUDE, where he walks amongst Kryptonian relics towards his new collection of space creatures. His face goes from somber to a small smile. He’s no longer the Last Son of Krypton. As he surveys the interplanetary zoo, he hears a dog bark behind him. 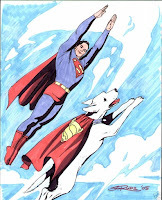 The last shot of the movie, Superman turns around, looking for the source of the barking. He looks up… and smiles. Obviously, there are some details that would need to be worked out (like how Superman and Van-Zee escape their bottles), but that kinda stuff comes after the outline, right? 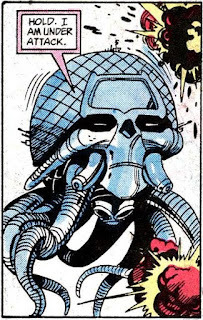 While there have been various versions of Brainiac, this one is based mostly on the 1980s reboot of the character by Marv Wolfman and Ed Hannigan). Also, if this were to take place in the world of Zack Snyder’s Man of Steel (and it could), then the script would reflect Lois knowing that Clark and Superman are the same. 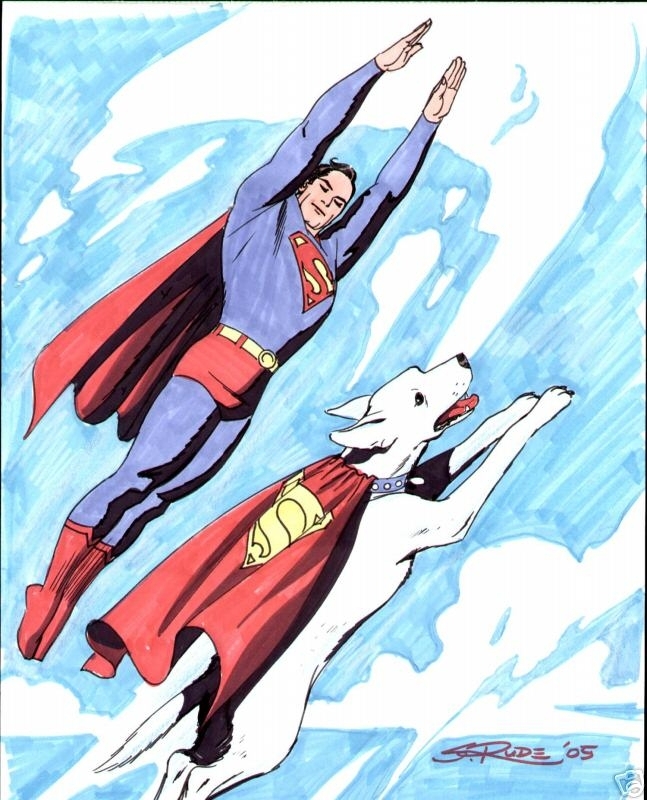 But either way, the point is that this story would hit all the Superman buttons (and even give him Krypto, fer cryin’ out loud!). And he doesn’t have to kill anyone, either.